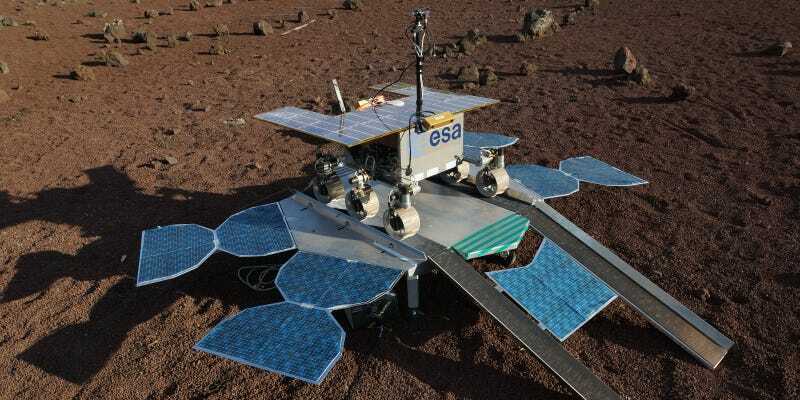 This is the European Space Agency’s ExoMars 2018 rover — kinda. In fact, its a half-scale model that’s been tested over the past few weeks in the ESA’s Mars Yard, but it does show what the vehicle will look like. It’s not the first time we’ve seen the rover this week, but you can see it far more clearly in this image. The testing took pace at a 80x50 meter outdoor simulation space, which mimics the Martian surface, at the end of October. [The team] were given no idea where in the sprawling Mars Yard the rover was located for each test scenario. The only information they had came from cameras and sensors in the rover and lander. Adding to the difficulty, realtime remote control of the rover was out – the sheer distance to Mars will make it impractical in reality. Instead, they could receive telemetry at regular intervals then send back a to-do list of commands. For the purposes of testing, these communication passes came once every hour – in reality they would occur once or twice a day. For each egress they worked to build up a detailed virtual model of the rover’s surroundings, as well as stitching together a panorama from the various camera views. The lander has two sets of ramps down to the surface, so the team had to decide which way down was safer. Of five tests, four were successful and one went wrong—the rover toppled off the ramps. But for a first set of tests, that success rate wasn’t too bad.